Tropical Storm Rachel is located about 485 mi…780 km W of the southern tip of Baja California with maximum sustained winds…40 mph…64 km/h. Present movement…stationary. Tropical storm 18w (Phanfone), is located approximately 117 nm northeast of Saipan, and is tracking northwestward at 16 knots. France – The litany of flash floods caused by extraordinarily heavy rainfall in 2014 grew even longer Monday after record-shattering rainfall struck one of southern France’s largest cities. 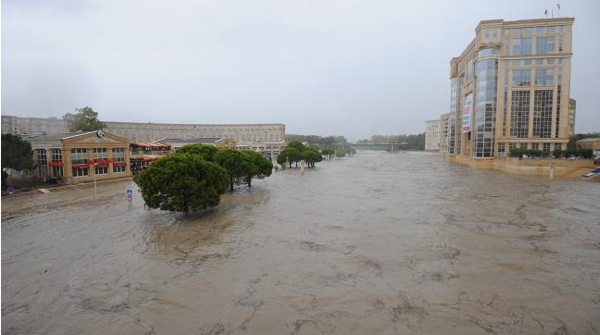 Montpellier, a city of 264,000 along France’s Mediterranean coast, was hit with 252 millimetres (9.92 inches) of rain in just 3 hours, between 2 p.m. and 5 p.m. local time (9 a.m. and noon EDT in the U.S.). The exceptionally heavy rain flooded streets and quickly sent the river Lez out of its banks in the city centre. As of 8 p.m. local time, the city had tallied 295.6 millimetres (11.63 inches) of rain for the day, amounting to 47 percent of the city’s average annual rainfall of 24.77 inches. Man-made climate change stoked some of 2013’s most extreme heat on the planet, a new report shows. 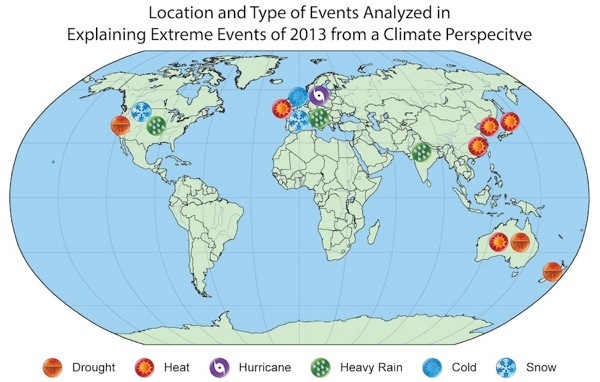 Twenty-two separate research teams analyzed 16 of last year’s extreme weather events, including the California drought and devastating flooding in Colorado, to determine whether climate change — primarily caused by the burning of fossil fuels — made any of the events more likely or severe. Scientists found clear fingerprints of climate change on all five of the heat waves analyzed in the report, which was published in Bulletin of the American Meteorological Society. But for other events, isolating the impact of climate change from natural variability proved to be more difficult. Three separate research teams looked at the 2013 California drought, for example, but they didn’t find conclusive evidence for the influence of human-caused climate change. Climate change made it more likely for a “ridge” of high pressure to linger over the western United States, keeping storms and rain away from California in 2013, one paper found. But it’s not clear how this atmospheric pattern influenced changes in precipitation and temperature that drove California’s drought. Drought is a complex meteorological phenomenon, and its length and severity are influenced by several natural factors — including a lack of precipitation, snowpack availability, temperature and soil moisture — which are then compounded by land and water use, said Stephanie Herring, the report’s lead editor from the National Oceanic and Atmospheric Administration’s National Climatic Data Centre. “A clear picture of how long-term climate change impacted the California drought is yet to emerge,” Herring told reporters. Five of the research papers in the report were devoted to the historic heat in Australia. Last year was Australia’s hottest on record. The government spent about $300 million on a drought assistance package for affected farmers, and an intense heat wave occurred during the summer months, sending the average temperature 2 degrees F (1 degree C) above normal. “It’s hard to imagine how you could have had those temperatures in a world without climate change,” Peter Stott, the report’s co-editor at the U.K. Met Office Hadley Centre, said during a media briefing. Indeed, all five studies suggested human-caused factors increased the likelihood and severity of the record temperatures in Australia. Climate change also created conditions that were favourable for drought in New Zealand, and it contributed to heat waves in Japan, Korea, China and Western Europe in 2013, other studies found. Some weather events seemed to be natural anomalies. One group of researchers found that climate change was not directly to blame for the 17 inches (43 centimetres) of rain that fell over the course of one week around Boulder, Colorado, and the probability of another such event should actually decrease as the climate changes. Similarly, an unusually intense October blizzard in South Dakota last year likely wasn’t influenced by climate change and another event like it is unlikely to occur in the future, another paper found. The report speaks to some of the modelling limitations climatologists face when trying to understand man-made influences on complicated events like droughts and storms. Scientists clearly have the right tools to attribute human-caused climate change to heat extremes and temperature extremes. But temperature-driven events have a much stronger signal relative to the noise than events like storms and heavy rains, Stott explained. Tropical Storm Rachel is located about 485 mi…780 km W of the southern tip of Baja California with maximum sustained winds…75 mph…120 km/h. Present movement…N or 360 degrees at 5 mph…7 km/h. Tropical storm 17w (Kammuri), is located approximately 320 nm east-southeast of Narita Airport, and is tracking northeastward at 13 knots. Tropical storm 18w (Phanfone), is located approximately 325 nm east-southeast of Saipan, and is tracking west-northwestward at 12 knots. USA – Powerful thunderstorms brought heavy rain and strong wind to parts of Arizona, Utah and Nevada Saturday — flooding roads, delaying flights and leaving thousands without power. The Arctic’s shrinking sea ice is reshaping the region’s food web from the bottom up, a new study reports. Historically, tiny plantlike organisms called phytoplankton burst into bloom in the spring in the Arctic Ocean. The enormous one- to two-week bloom sets off a feeding frenzy among zooplankton, fish and bottom-dwelling creatures at the base of the Arctic food chain. “The entire ocean system is linked to this massive input of carbon,” said lead study author Mathieu Ardyna, a marine biologist at Laval University’s Takuvik Joint International Laboratory in Quebec, Canada. But now, because of the declining sea ice, a second bloom also appears in the fall, according to a new analysis of satellite records, published Sept. 2 in the journal Geophysical Research Letters. The fall bloom could have widespread ripple effects on marine life and the Arctic climate. Phytoplankton clear carbon dioxide from the atmosphere through photosynthesis. Annual spring and fall phytoplankton blooms are a common feature in warmer oceans, from the cool north Atlantic to the hot, tropical Pacific. The double Arctic blooms may herald a shift from a polar to a more temperate ecosystem. However, the trends are so new, and varied across the Arctic, that the researchers can only speculate what the final impact will be. “For sure, the carbon cycling will change a little bit, but the question now is to understand how the rest of the plankton and fish will respond to this new pulse of phytoplankton,” Ardyna says. Ardyna and his co-authors charted phytoplankton blooms between 1998 and 2012 with satellite data that measures ocean colour (a proxy for phytoplankton levels). The researchers also looked at sea ice extent and wind speeds. The results showed that fall plankton explosions are becoming more frequent throughout the Arctic Ocean up to 80 degrees north latitude. At these high latitudes, there are no plankton blooms at all because of permanent sea ice. The largest increases were seen in the Eastern Arctic Ocean, especially north of Russia, where ice once prevented plankton blooms. “The percentage change is really high here because this is where there used to be ice,” Ardyna said. The western Arctic includes Alaska and Canada, while the eastern Arctic encompasses northern Europe and Russia. The researchers said the plankton is likely thriving in fall for two reasons: delayed freezing and strong winds. In the fall, new sea ice starts to form when ocean temperatures fall below about 29 degrees Fahrenheit (minus 1.9 degrees Celsius). But as the Arctic sea ice shrinks, the ocean absorbs more of the sun’s heat in summer, postponing the freeze until all the warmth dissipates. There were also a greater number of strong fall storms in the last decade, which can stir up nutrients to feed a phytoplankton bloom. Progress continued Sunday in the fight against Oregon’s remaining significant wildfires, with the possibility of rain on Monday and Tuesday offering potential further relief. In Estacada, the 36 Pit Fire was 69 percent contained by Sunday evening, though several roads, including Highway 224 remained closed to the general public, but open to residents and workers escorted by pilot cars. The 5,520-acre blaze began Sept. 13, and investigators have since determined the fire was started by target shooters’ hot bullet fragments igniting dry tinder near the out-of-use rock quarry. In Josephine County, the 4,134-acre Onion Mountain Fire was 95 percent contained Sunday, and the last heavy helicopter that was assigned to the fire was released at the end of the shift. Firefighters expect to have the fire fully contained by Tuesday. The fire began on Sept. 13. The Deception Complex Fire near Oakridge also was 95 percent contained Sunday, with milder temperatures and a lower sun angle helping in firefighting efforts. The 6,033-acre fire began on Aug. 11 and was caused by lightning strikes. The weather forecast for Oregon could offer help in efforts against the wildfires. A weak weather system is expected to move into the state Monday, bringing the possibility of rain on Monday and Tuesday. A high pressure system is expected to bring back warmer and drier weather Wednesday through Saturday. There are still two massive blazes crews are trying to contain. The Chelaslie River Fire has been burning since early July and it’s about 133,000 hectares in size and the Mount McCallister fire just west of Chetwynd is roughly 26,000 hectares. No homes are presently in danger. So far, BC has spent nearly $300 million fighting wildfires, burning through the initial $63 million budget. Bardarbunga (Iceland): Eruptive activity at the Holuhraun fissure remains stable. The lava flows continue to expand towards the north and particularly to the east, now over a snow-covered landscape as winter conditions set in. Earthquakes under the intrusive dyke decrease slowly, but remain frequent and strong under the caldera of the central volcano, which subsides at a more or less constant rate of 50 cm per day. 5.2 Earthquake hits offshore Maule, Chile. 5.2 Earthquake hits the Hindu Kush, Afghanistan. Tropical Storm Rachel is located about 475 mi…765 km W of the southern tip of Baja California with maximum sustained winds…80 mph…130 km/h. Present movement…NNW or 340 degrees at 6 mph…9 km/h. Tropical storm 17w (Kammuri), is located approximately 337 nm southeast of Narita Airport, and is tracking northeastward at 13 knots. On-take (Honshu): A large explosive eruption occurred at Japan’s second highest volcano today at 11:53 local time. An explosion produced an ash plume that rose approx. 4 km and a large pyroclastic flow that swept down the southwestern flank. At least one woman was killed by the eruption and several others, approx. 50 persons, were severely injured. The volcano is a popular hiking destination and at the time of the eruption, about 150-200 people were on the volcano. The bodies of 31 hikers have been found near the top of Ontake a day after the sudden volcanic eruption. 45 hikers are still missing. 5.0 Earthquake hits central Alaska. 5.0 Earthquake hits Catanduanes in the Philippines. More than 600 small earthquakes have rattled the Mammoth Lakes region in less than 36 hours as ripple effects continued across one of the most seismically active volcanic regions in California, according to the U.S. Geological Survey. The swarm of quakes — ranging from magnitude 1.0 to 3.8 — began just before 5 a.m. Thursday. Earthquake swarms are not uncommon to this region in California’s Eastern Sierra. Countless small faults crisscross the area known as the Long Valley Caldera, Shelly said. This roughly 20-mile-wide crater-like depression, adjacent to Mammoth Mountain, was formed from ash and pumice deposits during a volcanic “super eruption” about 760,000 years ago. Tropical Storm Rachel is located about 460 mi…745 km SW of the southern tip of Baja California with maximum sustained winds…65 mph…100 km/h. Present movement…NW or 315 degrees at 8 mph…13 km/h. Tropical storm 17w (Kammuri), is located approximately 173 nm east-southeast of Iwo To, and is tracking north-northwestward at 09 knots. Once a sprawling oasis in the mostly arid Central Asian countries of Kazakhstan and Uzbekistan, the Aral Sea is now a fraction of its former self. 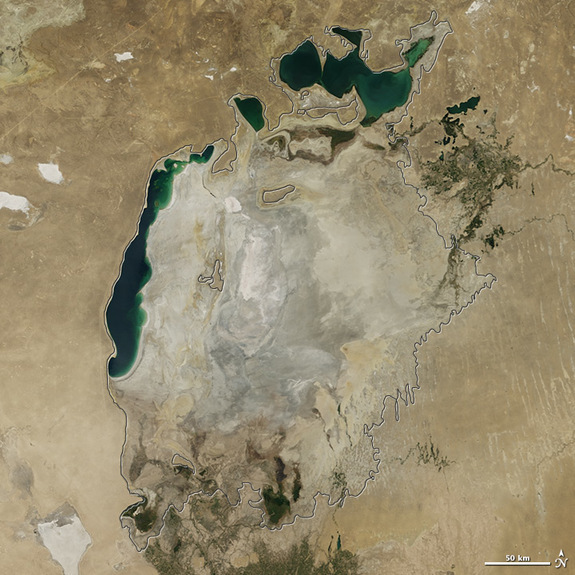 Images captured by a NASA satellite show that the eastern basin of the South Aral Sea is now completely dry. The two photos — one taken on Aug. 25, 2000, and the other taken on Aug. 19, 2014 — show the stark difference in the Aral Sea’s appearance. The once-extensive waters of the eastern lobe (shown in emerald green in the satellite photos) have disappeared. 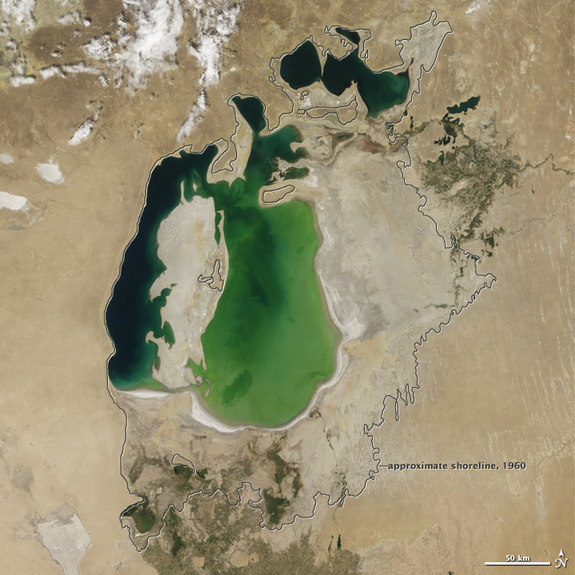 The Aral Sea, once the fourth largest lake in the world, began shrinking after the Soviet Union started diverting water from two large rivers — the Syr Darya and the Amu Darya — in the 1950s and 1960s. Dams, canals and other structures changed the surrounding desert into farmland for cotton and other crops. But, without the rivers, the Aral Sea began to disappear. Fisheries and communities that depended on the lake also began to collapse. As it shrank, the lake became saltier and absorbed more pollution from agricultural fertilizer and pesticides. Salty dust from the exposed lakebed became a public health hazard, which in turn increased water demand, as farmers required more water to flush the salt out of their crops. The loss of the lake is also affecting the climate, with the region experiencing colder winters and hotter and drier summers. A fire that has raged for most of the week in the mountains between Swellendam and Barrydale in the Western Cape has been extinguished, an official said on Saturday. The fire originally broke out in the area after a lightning strike on Tuesday night. No structures were damaged.